Thunder Bass, which we all guessed, is an amp head for bassists. 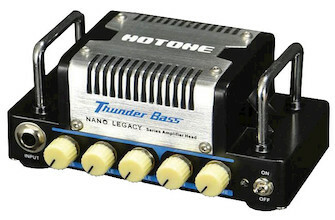 Based on the Ampeg SVT, Hotone somehow got all the big thunderous sound into a mini-sized amp. Whether you are the bassist in the spotlight or the one keeping the pulse in the shadows, this solid amp will suit. Flexible and dynamic, it's as stable as the most stable member of the band.